For my son's second birthday party, we decided to work with an outdoor safari theme in our back yard, to mirror our vacation to Disney World a month previous and Disney's Animal Kingdom and Rainforest Cafe (which he loved so much). INVITATIONS: I purchased printing paper at Staples with a childlike safari border of monkeys, giraffes, elephants, and zebras. The entire page was the invitation, which included Come join Maddox when he turns two on a wild safari tour". We also had to include directions to our home which I purchased at Hobby Lobby for a dollar or two. DECORATIONS: I purchased a roll of Red Rosin paper from Lowe's which was about 600 square feet (and barely put a dent in it.) I cut strips about 3 inches wide which I crumpled and then twisted into poisonous vines. Since the party was outside I draped the vines (about one hundred or so) from the ceiling of the back porch the doorway and taped some up to the screen. From Oriental Trader I purchased inflatable zoo animals several hanging palm trees palm tree and monkey streamers an inflatable palm tree cooler a roll of zebra paper a roll of tiger paper pith helmets and paper lanters. The inflatable animals were scattered all over the yard. The monkey and palm tree streamer was draped from the canvas of the party tent we'd set up. I used the rolls of animal print paper as table runners for the long party tables we set up in the back yard with animal print candles and fresh Pineapples as center pieces. The zebra table had an inflatable zebra sat at the end the tiger had a tiger etc. -This way you could indentify which guests were at which tables. I had three bouquets of balloons made using animal print balloons and palm tree and safari Mylars from Dean's. These sat on the table ends as well. I hung the palm trees from the gutters around the house and the paper lanterns in the trees. I also hung monkeys and parrots from the tree limbs. I created a cd of jungle sounds I had gotten from iTunes: elephants monkeys tigers frogs even the song that plays on Disney's Jungle Cruise ride and a song from Disney's Animal Kingdom which you hear when you are walking through (both have animal sounds also). I positioned the stereo speakers where they weren't easily seen and looped the cd for the duration of the party minus Safari Steve's show. ACTIVITIES: In leiu of games and costumes as the guests (children) came through the gate each one received their own Pith Helmet and then sat down with me to have their faces painted. This was a relatively easy activity and I bought the face paints from Hobby Lobby for about five dollars. I looked up painting ideas online before the party. I painted several kids up as tigers some as monkeys a couple of zebras a bear a Safari princess a white tiger and a lizard. This does not require perfect or a lot of skill - Most kids are just excited to be able to have their faces painted and think it's wonderful. The lizard turned out the best followed by the tigers and it was fun for me and the kids. After face painting we had a special visitor arrive. About a month prior to the party I hired a company called Silly Safaris to appear at the party and perform a live exotic animal show for the kids. Silly Steve came all the way from Indianapolis with nine exotic animals (a trained owl a baby alligator a kinkajou a skunk etc.) and performed for fifty minutes with the animal having Maddox assist him and bringing up children who volunteered to work with the animals. The kids ALL loved this and Safari Steve did a wonderful job performing!! After the animal show the kids were allowed to enter the bounce house we rented from a local party rental store. The bounce area was about 12 by 12 feet and could accommodate all of the kids in attendance at once and a couple of adults. Those who did not care to watch the opening of gifts were welcome to bounce and no one wanted to leave! Each of the kids had their picture taken by me with Safari Steve which I used for thank you cards later. PARTY SNACKS: The party was at 2:30pm between meal times so we didn't focus on a meal. Instead I sat a punch bowl of Jungle Juice out (2 bottles of Fresca 4 scoops of lime Sherbert and green food coloring) chips and dip cheese and crackers Gummy worms and cupcakes. We also used the inflatable cooler for cans of pop for the adults and bottles of Bug Juice for the kids. After gifts we made banana splits for the kids and set up a decorating station with sprinkles M&Ms Gummies hot fudge and caramel where they could add their own toppings. CAKE: In leiu of cake the evening before the party I made cupcakes in ice cream cones half with bright orange Whipped icing (food colored) and half with lime green icing and sprinkles. The kids loved these as did the adults. They were very good!! For Maddox I bought a small round 3 inch cake pan (the size of a really large cupcake and just big enough to accommodate a few candles). I bought a few of the long narrow birthday candles that sparkled and tucked in 2 oranges and 1 green as well as a #2 candle. FAVORS: Each of the children were able to take home pith hats animal print balloons an inflatable animal of their choice binoculars temporary tattoos and pencils. (Choosing balloons and inflatable animals also helped with the clean up of the decorations!!) The other party favors I was able to purchase online at Oriental Trader fairly inexpensively for bundles. All in all this was a wonderful party and no one even the adults were able to stop talking about it. People were coming up to me at work going "I heard you had a REALLY GREAT PARTY on Saturday!!!!". This was a fun experience for both the kids and the adults and everyone had a memorable time. The weather was sunny but not too hot and ideal for such a day. 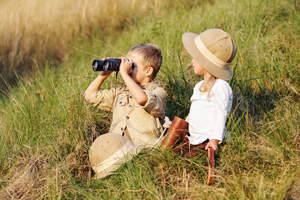 I hope this helps you with some ideas for your Safari!"